A cataract is an opacity, or clouding, of the lens in the eye. The opacity can cause blurred vision and eventual blindness. Light enters the eye through the cornea, which is the transparent covering of the eyeball. Then the light passes through the lens, which bends the light onto the retina at the back of the eye. In an eye with a cataract, light can no longer pass through the clouded part of the lens. Cataracts are often associated with aging and are thus called "senile cataracts." They can also be caused by diabetes, parathyroid gland abnormalities, Down's syndrome, and other medical conditions. Recent studies suggest that exposure to the ultraviolet radiation in sunlight and artificial light during childhood may have an effect on the formation of cataracts in later life. Cataract surgery has a long history. It was mentioned in the code of Hammurabi, a Babylonian king who lived 4,000 years ago. The first known cataract operation to extract a clouded lens was performed by J. Daviel, a Frenchman, in 1748. Another well-known surgeon, W. Cheselden, restored sight to a man born blind. In a surgical procedure called an introcapsular extraction, the entire lens is removed through a cut made along the top edge of the cornea. 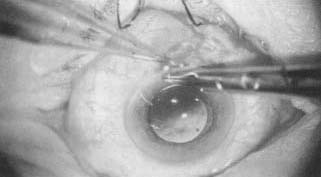 In this surgery, invented by an American named Kelman in 1976, an ultrasonic device actually emulsifies (breaks) the lens into tiny fragments so that it can be aspirated (suctioned) from the eye. A plastic lens is then inserted, and the incision is closed with tiny sutures. Plastic lenses were first invented in 1952 by the English physician Harold Ridley. The plastic lens may completely restore vision, or the patient's vision may require fine-tuning with additional eyeglasses or contact lenses. Cataract surgery becomes necessary when the lens of the eye becomes 'clouded' and no longer allows light to reach the retina. banks have been established in many places around the world to store donated eyes for transplants. In 1961, an American physician, Irving S. Cooper, began using a freezing technique known as cryosurgery to freeze and destroy damaged tissue. Cooper first used cryosurgery on the damaged brain tissue of Parkinson's disease (a progressive nervous system disorder) patients. Now it is successfully used to remove cataractous lenses. In 1979 Professor Daniele Aron-Rosa performed the first laser eye surgery to use the ultra-rapid, pulsated Yag laser. Lasers allows surgeons to work without having to cut the eye. Laser surgery has also been successfully used on corneas and detached (unattached) retinas. I cannot find an answer on the internet, My 19 year old granddaughter has cataracts, she has down's syndrome. Is there any reason that she is not eligable for surgery? Is there a certin type of cataract the is inoperable? Most of the down syndom related cataracts are operable. DO not worry. We prefer to operate down syndrom eyes under general anestesia both eyes same day. the first catract surgery was done by indian saint susrutha. the surgical weapen used by him was known as jaba mukhi. then he washed the eye by hot "ghee" and covered the eye with cotten bandage. the surgery was successful.